In the Valley of the Rainbow lives a little red dragon named Redtail Smalltooth. A huge, beautiful rainbow colors the sky above all the dragons who call the valley their home, but Redtail wishes for something less ordinary. The ‘Rainbow Dragon’ is a children’s picture book about a young dragon who has an ‘imaginary’ child human friend. Should you wish to, you can contact the author via Facebook or Twitter. If you would like a free copy in exchange for you honest feedback on the book, get in touch with the author now. Before you leave, you can get FREE downloadable illustrations for children here! 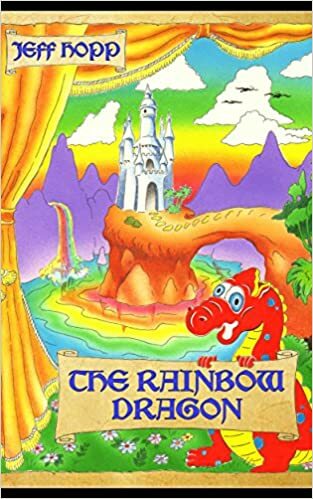 This entry was posted in Uncategorized and tagged children's book, children's books, children's picture books, Jeff Hopp, picture book, The Rainbow Dragon, The Rainbow Dragon by Jeff Hopp. Bookmark the permalink. This is a lovely and colourfully illustrated but very short story book for little children. A baby dragon lives in a world without humans . . . then one day, he meets a human child. I absolutely loved reading this book. I think it is best suited for younger children and as a board book.